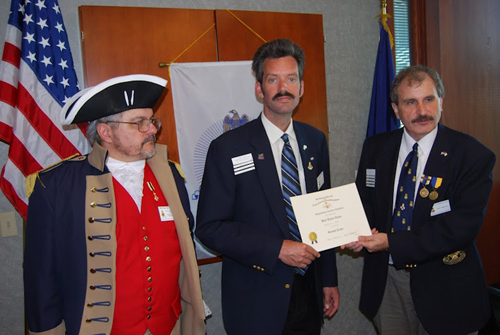 President Dirk Stapleton presented Compatriot Paul Toms with a Supplemental Certificate at the 324th Meeting on Saturday, June 9, 2012, on his patriot ancestor, Joseph Crane. Congratulations to Com­patriot Toms! Photo (L - R): Compatriot Perry Dean “Bud” Marks, Jr.; Compatriot Paul Toms, and President Dirk A. Stapleton.